In this well-reviewed political memoir, author Janet Levine, writes of her childhood in South Africa, her dawning political activism, her later struggle alongside hundreds of dedicated comrades within the anti-apartheid movement, and her move to the United States with her American-born husband and two sons. The memoir is suffused with the author’s love of South Africa—the people and the land. Inside Apartheid (1988) bears witness to the horrors of living within the apartheid system from the perspective of a white activist. Levine, a crusading freelance journalist, was an elected public official, and she held office in many anti-apartheid organizations. She shares her love for the country as she fights against the tyranny of racism that tears at the lives of all South Africans. 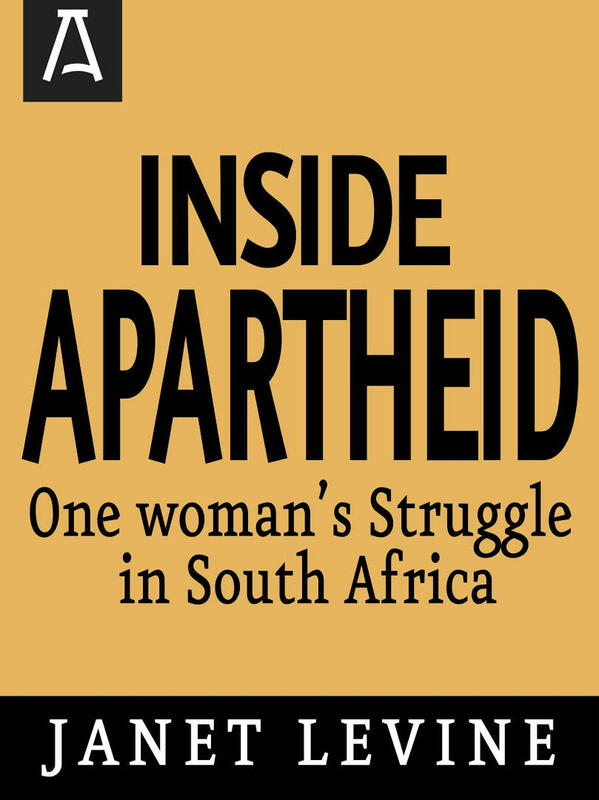 Inside Apartheid was reviewed in the New York Times Book Review, The New York Review of Books, Kirkus Review, et al. Full Kirkus review: A grim account by a white liberal South African expatriate of life “”in the belly of the beast”” that is apartheid. Levine, who now lives in Massachusetts with her American husband, developed a social conscience early. Unlike many of her schoolmates, she was appalled when a young black man was shot in the family backyard for “”illegally”” visiting his mother, the family’s housekeeper. Later, as a journalist and an elected member of the Johannesburg City Council, Levine spoke out against the government’s increasingly restrictive policies and called for full civil rights for all South Africans. She also served on the board of the first black-owned business cooperative (a taxi operation) in Soweto and helped foster the formation and growth of the black union movement. Meanwhile, the government simply continued to polarize the races: it opposed “”illegal”” black unions, banned various black newspapers, and continued to move nonemployed blacks to barren, fenced-in “”homelands””–where, says Levine, the people are slowly starving and dying on a scale equal only to that of the Nazi concentration camps. She wishes the US would not disengage from South Africa but would invest more and force change from within. Otherwise, she fears, an “”increasingly militaristic white oligarchy”” will be replaced “”after a long and bitter struggle”” by a “”militaristic black oligarchy.”” Levine writes evocatively of the natural beauty of her “”wild, magnificent, seductive motherland”” and of the starkly contrasting ugliness of impoverished black townships, the bleakness of black “”hostels”” where workers crowd, and the desolation and hopelessness of the “”homelands.”” A compelling, chastening work.